A research associate in meteorology mutating into a computational scientists with a strong drive to use modern software development tools and always learn more. I finished my M.Sc. in meteorology with excellent grades and multiple years of experience in the field of turbulence resolving computational fluid dynamics (Large-Eddy Simulation) in my pocket. Coming from a high performance and parallel computing background (using C, Fortran, MPI, OpenMP and bash) with multiple years of working-experience on state of the art supercomputers, I am always keen to contribute to software optimization. This encouraged me to work on porting software to current generation NVIDIA GPU and Intel Many Integrated Core processors, where I eventually earned my first publication. By the way, it was love at first glance when I learned Python. Annoyed by unreliable software in the past, I strongly embrace unit and integration testing. My strong incentive towards automation quickly led me to being obsessed with the concept of continuous integration (I love GitLab). Recently I upgraded to continuous deployment (with Ansible and Docker). I apply these concepts as often as they are beneficial, to achieve a high ROI for my time. 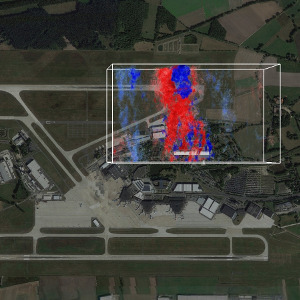 I'm currently on track to earn my PhD building a 3D high-res gust and fog prediction model for airport vicinities in cooperation with the German Weather Service (DWD). We aim to boost safety for aircraft during takeoff and landing. My favorite philosophy of live: To learn, do what you can't! My favorite definition of organizational culture: "Culture is repeated behavior." - Aristotle said, “We are what we repeatedly do.” - We tend to be happy, if we like what we are and according to Aristotle we can achieve happiness if we like, what we repeatedly do. Therefore, my greatest concern at work is the organizational culture. It better be good! Research associate at the Institute of Meteorology and Climatology supporting the development of the Parallelized Large-Eddy Simulation Model PALM. I'm on track to earn my PhD building a 3D high-res gust and fog prediction model for airport vicinities. I am funded by the extramural research program of the German weather service (DWD). Research assistant at the Institute of Meteorology and Climatology supporting the development of the Parallelized Large-eddy Simulation Model PALM, creating 3D scientific data visualizations, optimizing PALM for Multi-GPU Systems and Intel Many Integrated Core Processors, parallelizing random number generators and instructing scientists to use PALM on international workshops. Three years of meteorology (M.Sc.) with computer science as a minor. Specialized in numerical fluid simulation techniques and related software development. Three years of meteorology (B.Sc.) with physics as a minor. The overall goal of the project is the development of a new LES-based system for short-range forecasting of near-surface high-impact weather at airports. The system will deliver operational forecast capabilities of critical conditions relevant for aviation and airport operation, namely the forecast of dense fog and severe wind gusts in stormy weather.